Stock - SUI Solutions. 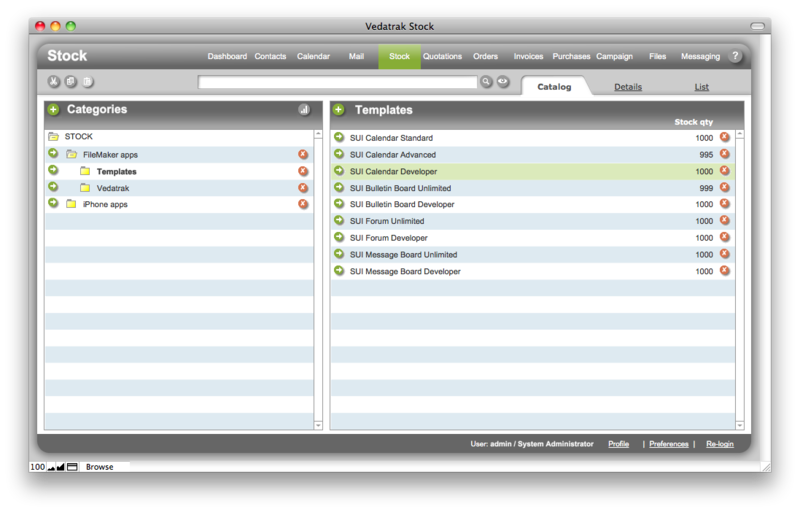 FileMaker Templates. Professional Software Development for FileMaker. The Stock module allows you to organize your company's products and services in an easy to navigate catalog that saves you time by storing data associated with each product. Use this module to add products onto an order. Full IWP support allows users to easily access and edit data from virtually any web browser without purchasing or installing additional FileMaker Pro copies. All products can be organized using different categories or markets in an easy to use tree format. Your Stock quantity is always actual. Increases at Purchase Order creation, decreases at Sales Order creation. Be aware of low stock quantity. Make your purchase in time. Price matrix allows you define up to 4 price levels for different kind of customers and unlimited ordered quantity ranges for each level. Your price-list has never been so flexible. You can define several vendor contacts for each product. Store actual prices of all vendors and just select the best one. Each product can be associated with a task in Calendar. A manager, for instance, can schedule a meeting regarding a product with a group of sales reps.
*This module requires the purchase of Vedatrak Base Pack in order to function. ** If you already purchased Vedatrak Products 2.1 and want to upgrade to Vedatrak Stock 3.1, you will be offered a special upgrade price. System will automatically check Your Downloads and define if you're performing an upgrade. Purchasing a support package in conjunction with Vedatrak Orders will enable you to rest assured that all technical aspects of using our product will be handled so you are free to provide you or your team with the professional support to effectively use it.